IMAGE: Simone Biles of the United States celebrates winning the gold medal in the women's Vault final on Day 9 of the Rio Olympics at the Rio Olympic Arena on Sunday. Photograph: Alex Livesey/Getty Images. 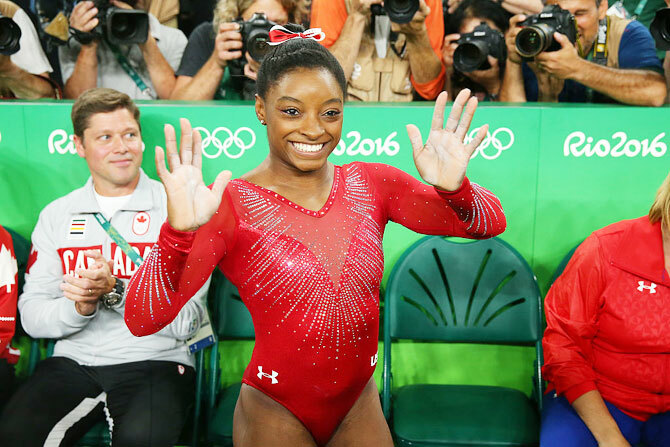 All-around champion Simone Biles scooped her third gold medal at the Olympics when she soared to victory in the vault final. Uzbekistan's Oksana Chusovitina, bidding to become the oldest ever gymnast to win an Olympic medal at the age of 41, finished seventh out of the eight finalists after over-rotating on her Produnova. Max Whitlock ended Britain's 120-year wait for an Olympic gymnastics gold medal when he upstaged favourite and twice world champion Kenzo Shirai to win the men's floor exercise title on Sunday. 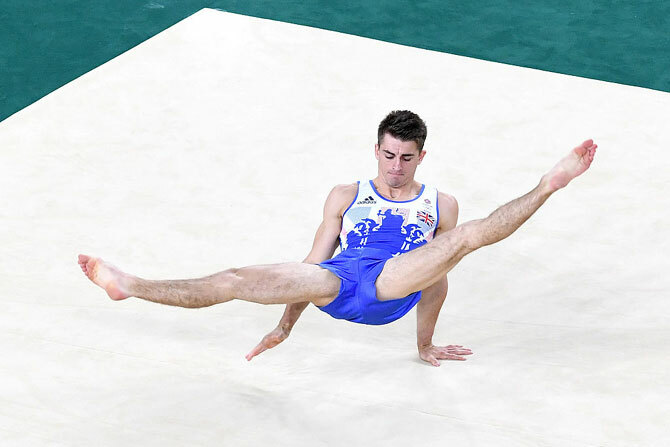 Whitlock produced a series of gravity-defying tumbles to win gold with a score of 15.633 while Brazilian Diego Hypolito made up for his flop shows at the last two Games by claiming silver to the delight of the partisan crowd. Shirai finished fourth after almost sitting down following one of his tumbling runs and stumbling on the next. All around champion Kohei Uchimura was fifth. Kenyan Jemima Jelagat Sumgong evaded a protester who leapt onto the Rio marathon course on Sunday to become the first woman from her country to win Olympic marathon gold in two hours, 24 minutes and four seconds. 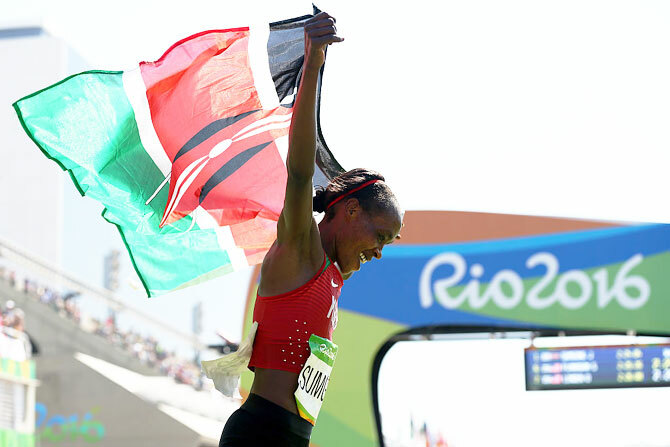 Bahrain's Eunice Jepkirui Kirwa claimed silver in 2:24:13 and Ethiopian Mare Dibaba snatched the bronze in 2:24:30. Sumgong, 31, said the man on the course immediately brought to mind memories of the April London Marathon, when she experienced a similar incident. 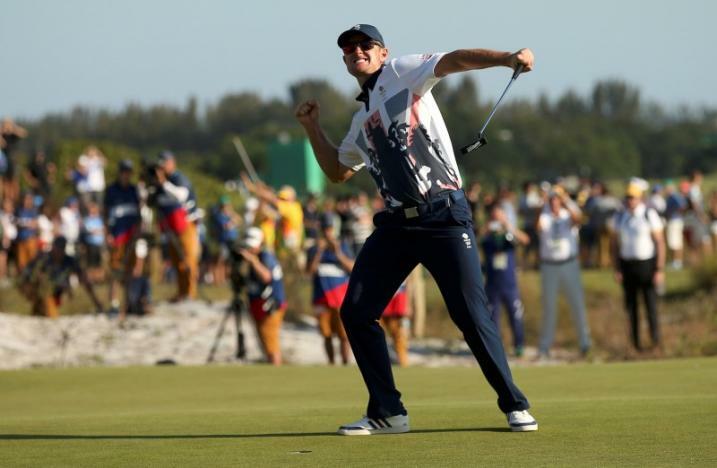 IMAGE: Justin Rose of Britain celebrates his gold medal win in the men's Olympic golf competition. Photograph: Andrew Boyers/Reuters. Britain's Justin Rose birdied the final hole to win the Olympic golf tournament on Sunday, the first gold medallist in a sport that returned to the Olympics in Rio after a 112-year absence. Rose, who scored a hole in one on his first day, carded a final round four-under-par 67 to beat Henrik Stenson by two strokes in a competition that went all the way to the final putts. IMAGE: Niccolo Campriani of Italy during men's 50m rifle three position qualification at the Olympic Shooting Centre. Photograph: Guy Rhodes-USA TODAY Sports/Reuters. Niccolo Campriani won men's 50m rifle 3 positions gold on Sunday for his second Olympic title in Rio. 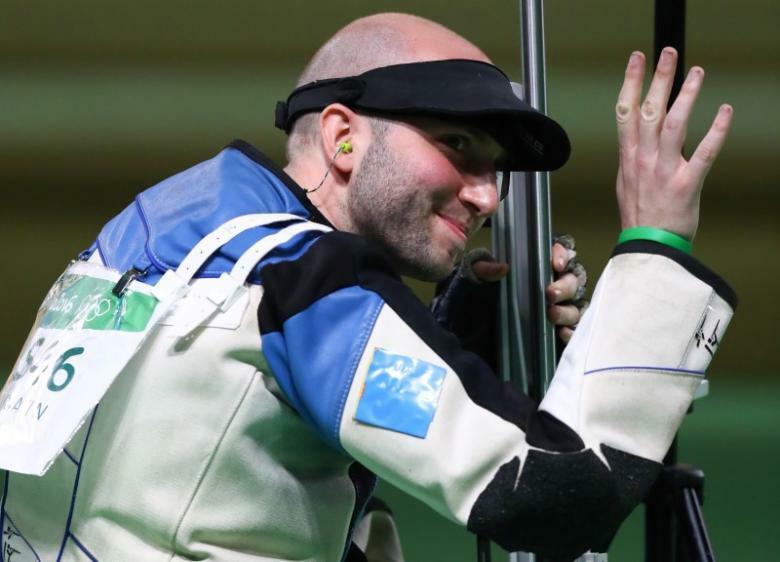 The Italian shooter, who clinched the 10m air rifle title last Monday, finished with a bang to overhaul Sergey Kamenskiy 458.8 to 458.5. With the Russian in silver the bronze medal went to France's Alexis Raynaud who finished with a score of 448.4. IMAGE: Silver medalists Venus Williams and Rajeev Ram of USA receive their medals. The US won gold and silver in mixed doubles. Photograph: Toby Melville/Reuters. 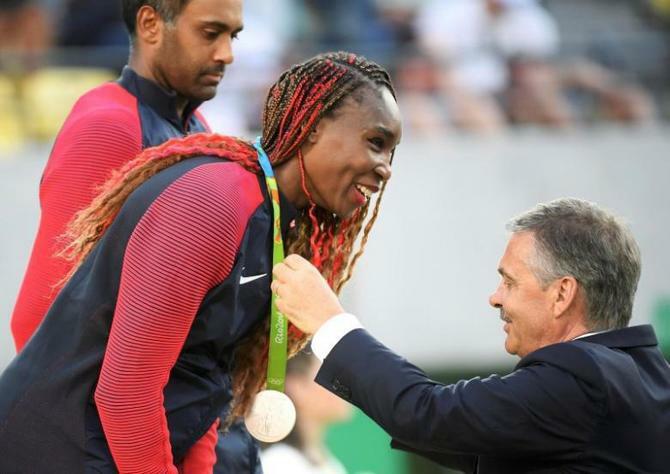 Venus Williams' record-equaling fifth Olympic tennis medal was silver rather than gold as she and partner Rajeev Ram lost an all-American mixed doubles final to Bethanie Mattek-Sands and Jack Sock on Sunday . Williams, who teamed up with Ram at short notice for the tournament, looked on course for a fifth gold when taking the first set but eventually lost 6-7(3) 6-1 10-7.